The Thyssen-Bornemisza Collection is one of the most important private collections of paintings of the 20th century and its history is a fascinating one. Although originally a private collection, today it belongs to the Spanish public after its acquisition by the government in 1993, just a year after the museum was opened. In 2004 a significant part of the Carmen Thyssen-Bornemisza Collection was added to it; a collection of over two hundred works that add to the examples of artistic styles and genres of the permanent collection. Dürer, Rafael, Titian, Rubens, Rembrandt, Caravaggio, Manet, Renoir, Cézanne, Van Gogh, Gauguin, Kandinsky, Picasso, Hopper, Rothko. This is just part of the impressive list of great names that make up this collection, the work of just two generations. As though from a textbook, all the artistic movements of Western art from the 13th to 20th centuries are included in the collection, highlighting the exquisite taste of Baron Heinrich Thyssen-Bornemisza (1875-1947) and of his son Baron Hans Heinrich Thyssen-Bornemisza (1921-2002). Although the main driving forces behind the collection were Baron Heinrich and his son Baron Hans Heinrich, it is important to mention August Thyssen (1842-1926). August was a hugely successful industrialist who commissioned the sculptor Auguste Rodin in 1910 to create a series of seven marble figures to start a collection of sculptures. Sadly, the outbreak of World War I interrupted this project. August died in 1926 and the set of Rodin sculptures passed to a branch of the family that had settled in Germany. Only in 1956 these sculptures were bought back by Baron Hans Heinrich Thyssen-Bornemisza and added to his collection. Today, four of them are part of the Carmen Thyssen Collection. Standing on either side of El Paraíso by Tintoretto in the museum’s entrance hall, they welcome visitors every day. It is from the correspondence between August Thyssen and Rodin that we know that his son Heinrich, the third of seven children, started his own art collection. 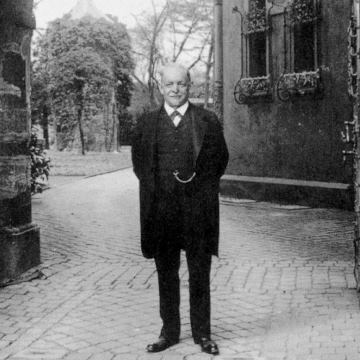 Heinrich Thyssen, having completed a doctorate in Philosophy at the University of London, married Baroness Margit Bornemisza de Kászon, daughter of a Hungarian nobleman, in 1905, a became the first Baron Thyssen-Bornemisza. The couple settled Schloss Rohoncz in present-day Hungary, but in 1919 they moved to Amsterdam. It was there that they set up the headquarters of their business and where, in 1921, their son Hans Heinrich was born. In spite of the difficulties of the post-war era, Heinrich continued adding to his collection with mainly old masters, and by the year of his death in 1947 had collected an impressive 525 works. In 1930 his collection was exhibited to the public for the first time in the Neue Pinakothek in Munich. The exhibition was a great success and a milestone for art historians of the time. It encouraged the Baron to continue collecting, also widening his interest to include furniture, tapestries, sculptures, jewellery and other works of art. To house his ever-growing collection and to protect it from the turbulent politics of interwar Europe, in 1932 Heinrich bought Villa Favorita in Lugano from Prince Leopold of Prussia. He lived in the villa from then on and had a gallery built in its gardens. He wanted to exhibit his collection to the public and made sure the gallery provided the optimum conditions for his works. The gallery opened in 1936, but closed again just a few years later with the outbreak of World War II. It reopened again in 1949, the same year in which Heinrich died and the youngest of his children, Hans Heinrich, took charge of the collection. On his death, the collection was divided between the four children of the first Baron Thyssen. Hans Heinrich, the youngest and just 26 years old at the time, was the only child who decided to follow in the footsteps of his father. He was also in charge of the family business. Hans Heinrich worked hard to reunite many of the works that had been scattered by the inheritance, and it was not until 1956 that he managed to buy his first painting that had never been part of the collection before. It was Portrait of a Man by Francesco del Cossa. He continued to acquire old masters for a few years until 1961, when he bought his first modern painting: a watercolour by the German painter Emil Nolde. In fact, it was German Expressionist art that inspired his interest in more modern painting and he soon became interested in Impressionism, Post-Impressionism and the avant-garde movements of the 20th century including Pop Art and Hyperrealism. The gallery in Lugano soon became too small for all the new acquisitions. Therefore Hans Heinrich had the idea of organising temporary exhibitions in different countries as a way to bring the collection to the widest audience possible. Just like his father, Hans Heinrich's passion for collecting was always underlined by the desire to bring it to the public. The works were not simply bought to be admired by the family; instead, both men sought to make the collection as accessible as possible. "A painter does not work for the eyes of a single man. My legacy as a collector is to share; and I can only return this gift by making it possible for as many people to see his work as possible and to understand the talent of the artist." (Hans Heinrich Thyssen-Bornemisza). Hans Heinrich organised a full programme of worldwide exhibitions in the 1960s bringing selections of works to cities in Germany, Japan, Belgium, France, Australia, New Zealand, Russia and the United States. He also organised two exhibitions in Madrid, one of modern masters in the Spanish National Library in 1986, and another of old masters a year later at La Real Academia de Bellas Artes de San Fernando . 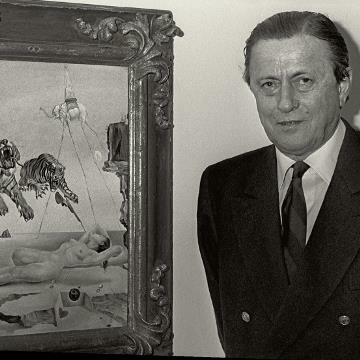 In the 1980s it became clear that the exhibition rooms in Villa Favorita were becoming far too small and Baron Hans Heinrich began to consider the future of his collection. 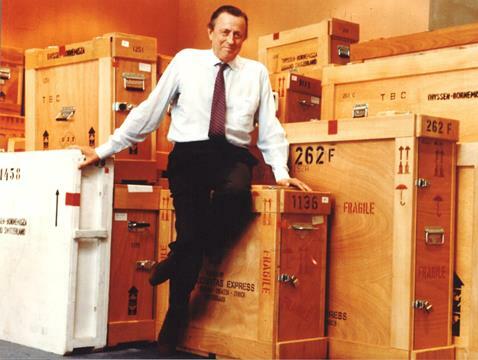 He needed a permanent location for his collection to give the public access to as many of his works as possible, as well as to ensure that the collection could remain together. 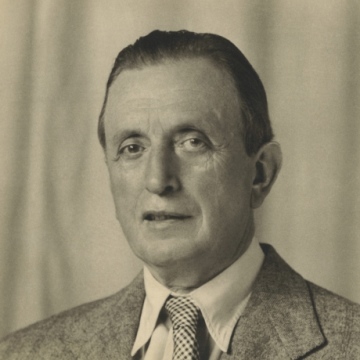 Hans Heinrich received a number of offers from governments and organisations from all around the world such as the Getty Foundation in Los Angeles and the British, German and Spanish governments. 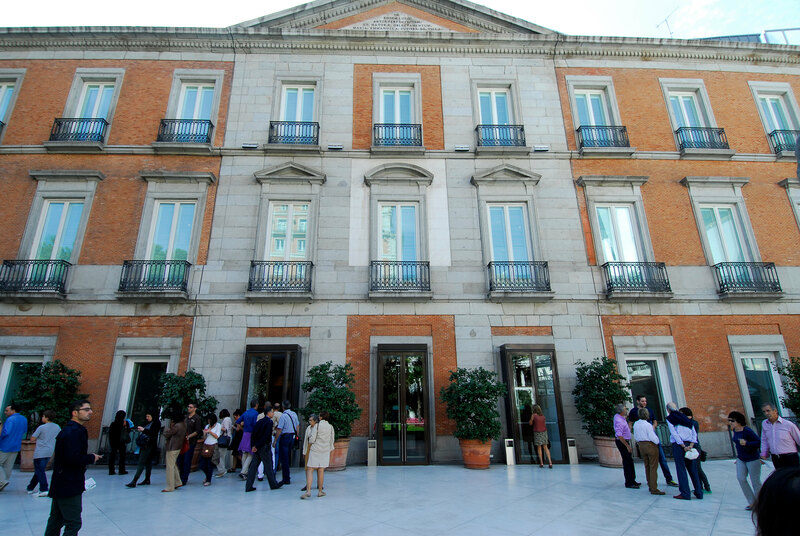 In 1988 the Spanish government put forward the idea of the Villahermosa Palace in Madrid, (diagonally opposite the Prado Museum) to house the collection. This solution guaranteed that the collection would stay together and be kept in the best conditions. It was also an excellent location for a museum. With the support of his Spanish wife, Carmen Cervera, the Baron decided on Spain. So in 1988 a nine-year loan agreement was signed, handing over the most important works of the collection to Madrid, and a small part to the Monasterio de Pedralbes in Barcelona. In exchange, the Spanish Government provided the building and set up a Foundation that guaranteed sufficient funds to manage the collection appropriately. The renovation of the Villahermosa Palace was led by the architect Rafael Moneo and was completed in 1992. Then, the largest move of works of art in the history of the 20th century took place, as everything was transferred from Lugano to Madrid. 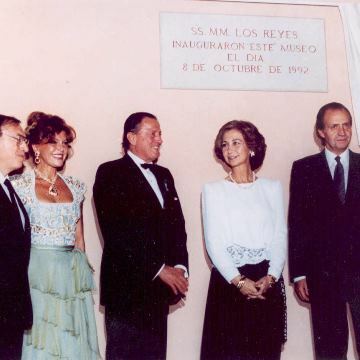 In October of the same year the king and queen of Spain inaugurated the museum. 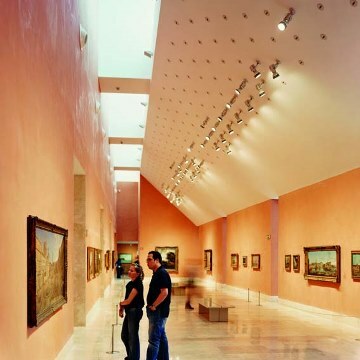 The museum was a great success with the public and critics alike, and the Thyssen family were also satisfied with the museum’s location and the quality of its facilities. The foundation made such good progress that in the summer of 1993, less than a year after the museum opened to the public, an agreement was reached whereby the state acquired the 775 works of art for $350 million dollars. The addition of the Thyssen-Bornemisza Museum created one of the most important concentrations of art in the world in the very heart of Madrid; with the Prado Museum and the Museo Reina Sofía, the ‘Art Triangle’ was formed. The collection of international paintings in the Thyssen-Bornemisza Collection perfectly complemented the old masters in the Prado Museum and the modern and contemporary paintings found in the Museo Reina Sofía. The Thyssen Collection also offered an excellent sample of 19th century American paintings, which had been all but absent from European museums. But the story does not stop here. Continuing in the family tradition, Carmen Thyssen also began to create her own collection with the Baron, and after his death in 2002 these were added to the legacy of her husband. In order to house some of these works, the Spanish state bought two buildings adjacent to the Villahermosa Palace that were renovated by the architects Manuel Baquero and Francesc Pla. In 2002, a free loan agreement was signed for an initial period of 10 years, which has been extended to the present day. The enlargement of the museum building, completed in June 2004, also created new office spaces, a temporary exhibition hall and space for various other services.